Customers also want information in a format that is immediate and easy to digest and in a format that they prefer. Podcasts allow your customers and potential customers to hear, in your own voice, the attributes and benefits of working with your company, says Chris Jensen, president of Audio Concepts in Bath, Ohio. And sometimes it’s just easier for a business owner to share information by talking about what they know and do in business. How do businesses use podcasts? Podcasting gives credibility and search relevance to your organization’s website. Topics covered can be anything pertinent to your target market, current events that affect your industry and best practices. An accountant, for example, could communicate through a podcast about how the new healthcare law will affect its clients’ businesses and what steps they need to take to be compliant. Current, relevant and presented in a concise manner will present the accountant as an expert. Add to the fact that most people today read less and less printed material, the accountant can present valid information with a podcast in a manner his clients wish to receive it. How do customers find my podcasts? : Podcasts are placed on your website. Podcasts should be added to any news page on the website with a brief overview. When a new podcast is produced, promote it through the social media the businessuses. Linkedin, Facebook and even YouTube (Audio files mixed in a video format can add visual elements, making it a vidcast). From these social sites, clients and others find and forward podcasts. This is how a podcast can act as a lead generator. Send your customers a message with Constant Contact or another e-newsletter tool. That will link directly to your podcast, too. In addition, register the podcast series through sites like iTunes. How are podcasts different from radio? The greatest difference between podcasts and other electronic media is the fact as a business you can tell your story without the 30- or 60-second time limits of traditional media. Also, podcasts are delivered at the listener’s convenience. As such, podcasts incorporate a much greater use of soft sell. The call to action is designed to gather client contacts – and ask for more information, contact us about, etc. But the greatest benefit for any business is the opportunity to differentiate from the competition. For a consumer products business, podcasts can be an integral part of any marketing campaign. Can I produce my own podcast? Anyone can set up a website, but that does not mean every business should. Same goes for businesses producing their own podcasts. A professional recording service can assist in more ways than just a clean recording environment. Everyday we work with the spoken word and understand how to make most speakers relax so they can perform at their best and convey their message effectively. This is important whether recording a radio commercial or a podcast series. Of even greater significance to the success of the podcast is the fact that a professionally produced podcast will sound better, be listened to longer and shared with more people. It might be tempting to save the cost of production but the benefits of a properly produced podcats will be negligible in the long run. Also, if you plan to produce podcasts consistently, recording multiples during a single session saves even more in the long run. How often should a business produce a new podcast? Consistency and relevancy are paramount. Plan to produce at least 1 or 2 podcasts a month so your listeners, followers and friends get in the habit of expecting something regularly. Podcasting for professional services is an integral part of a marketing plan just like the articles a business writes and discussions in which they participate on Facebook and Linkedin. All are designed to present the business as an expert in their field. Podcasting gives your business a voice and is another way to share that essential information that makes your business unique in a manner your clients, customers and potential customers want to receive it. 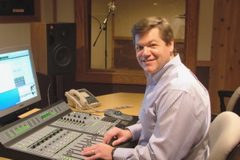 For more about podcasting for business, check out these tips and ideas from Chris Jensen and Audio Concepts. This entry was posted on Monday, January 31st, 2011 at 11:22 pm and is filed under Business, Podcasts, Social Media. You can follow any responses to this entry through the RSS 2.0 feed. Both comments and pings are currently closed.